Our new premium line of 4-1/4 inch fit-ups, or insert clocks have real polished brass bezel, a curved glass lens, 3 black metal clock hands and a top quality quartz movement. These new premium inserts fit into a common 3-1/8 inch mounting hole using our soft gasket mounting system. Our soft gasket mounting system allows you some flexibility about the size of the actual mounting hole. You can adapt these new inserts to a larger 3-1/4 inch hole size by removing the soft rubber gasket, and wrapping the back of insert with plumbers Teflon tape or electrical tape to “build up” the back of these insert clocks. 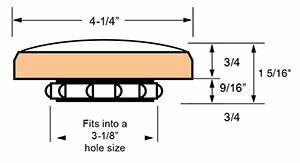 Then re install the soft rubber gasket to adapt to a mounting hole larger than 3-1/8 inches.